Receipt of lotus or throw up lotus festival of Amphur Bang Phil. It is enjoyable annual festival this will be hold before 2 days of oakpansa day. it is earlt in the morning of the fourteenth day of the eleventh waning moon. 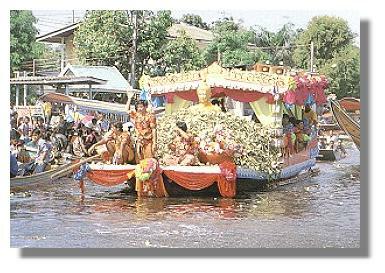 As for the custom of Bang Phli-people, they will throw up the lotus to the strangers who paddle along the samrong canal. The lotus recived will be respected to the monks on oakpansa day. Receipt of lotus will begin from early in the morning to about 8 o'clock. More over this festival is included the boat contest in variety catgories as will.